These high school students displayed various flags pertaining to the different military branches. Shown from left are Emma Smith, Abby Phillips, Montana Barton, Savannah Smith, Jessie Woodard and BreAnna Eddy. ARLEY - Veterans from many different wars were honored Thursday, Nov. 8, at the Meek High School gymnasium. The school assembly consisted of kindergarten through senior grades. Elementary Principal Heather Tucker welcomed everyone in attendance. “Boogie Woogie Bugle Boy” was known as the big band style and would have been played during World War II. High School Principal Marla Murrah spoke to the audience and veterans. Murrah then looked to the veterans seated on the gym floor. Chris Clark, U.S. Army National Guard. After veteran recognition, the sixth grade class performed “sign art” of Lee Greenwood’s song “God Bless the U.S.A.” All sixth grade gathered in front of the veterans and used sign language to convey the chorus of the song. Neil Feist, a veteran of the United States Air Force and called a hometown hero, gave a speech. Feist commented this was his first veteran program he has attended where there have not been any World War II veterans. “We call that generation ‘the greatest generation,’ and we’re losing them every day,” Feist said. “It’s a piece of cloth,” Feist said of the American flag. “But it’s a beautiful piece of cloth. It represents the freedoms we have in this country. When I see this representing what it means, like right here today or in parades, I get tears. The band then performed an “Armed Forces Salute” along with “America the Beautiful” and “Taps,” performed by Ana Rubley. 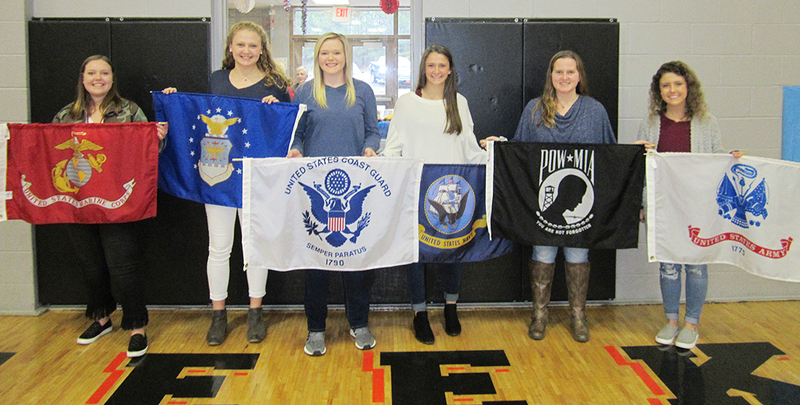 While the “Armed Forces Salute” was played, six high school students displayed flags of the different military branches: U.S. Army, U.S. Navy, U.S. Coast Guard, U.S. Air Force, U.S. Marine Corps and a prisoner of war/missing in action flag. At the end of the program, veterans and their families were invited to refreshments provided by the faculty of both elementary and high schools.